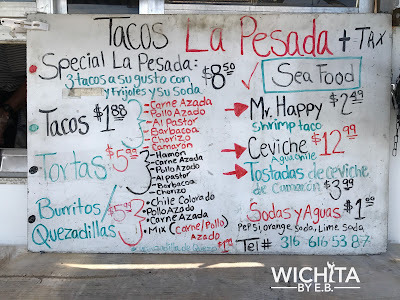 Food Truck: Tacos La Pesada Review – Wichita By E.B. 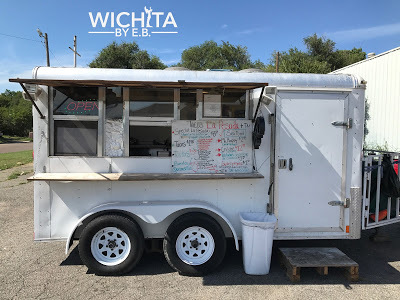 Our travels around Wichita continue to the northeast corner of 29th and Park Place, just a couple blocks west of 29th and Broadway. While randomly driving in the area, we came across a trailer sitting in an empty parking lot. Since I’m not one to be afraid of any establishment, I figured why not order some food to go? So that has brought us to our latest review on Tacos La Pesada! Upon arrival, the gentleman working inside by himself greeted me kindly with “Hello friend!”. We chatted for a while and he mentioned his truck has been around for a year and a half; extremely friendly and charismatic guy. I glanced through the menu and asked what he suggested. He quickly mentioned the Ceviche was one of his favorite items. 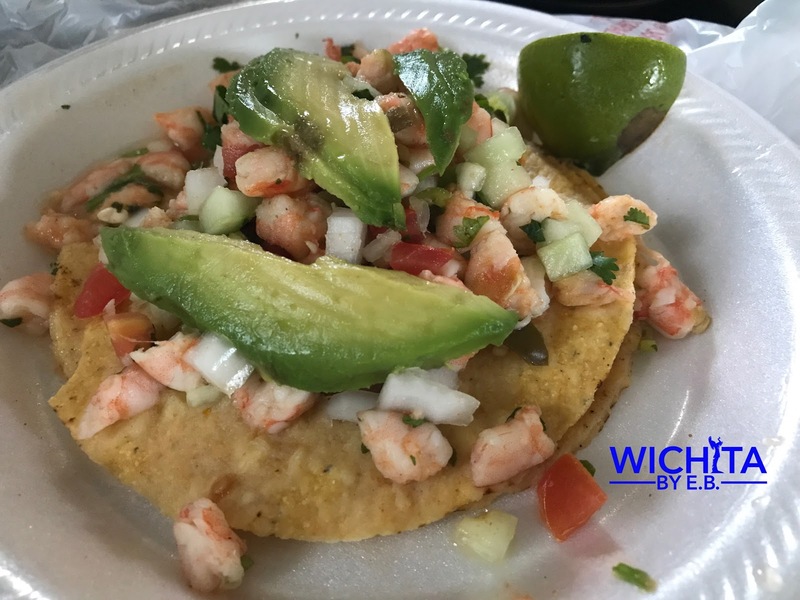 Knowing I would be ordering food for my family, I wasn’t sure they would be willing to try Ceviche from a truck off of 29th street. So I ordered the Tostadas de Ceviche for myself as I knew it’d be a smaller portion and then a bunch of tacos for everyone else. 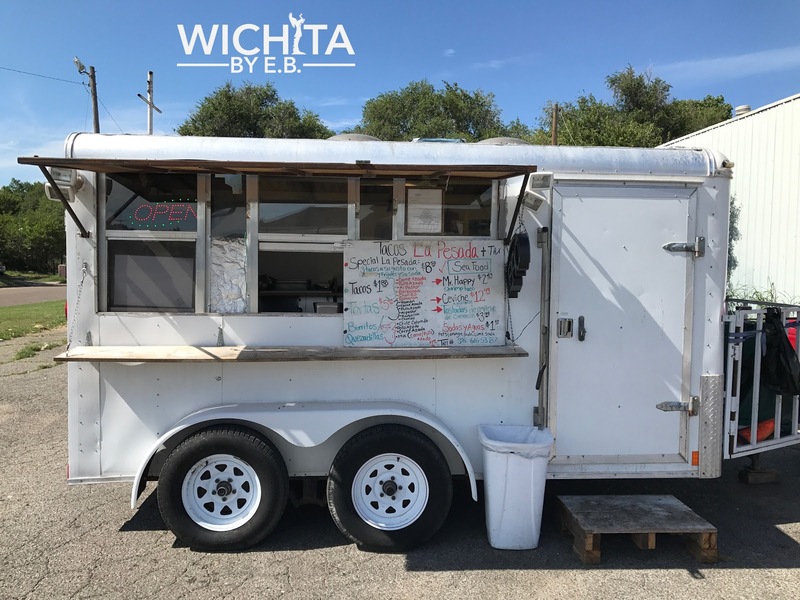 Their taco meat offerings were simple with the Carne Asada, Chicken, Al Pastor, Barbacoa, and Chorizo. They also had shrimp tacos which I wish I had ordered to try out. Noticeably missing was the Tripa and Lengua from the selection. The order ended up being the Carne Asada, Chicken and Al Pastor tacos. 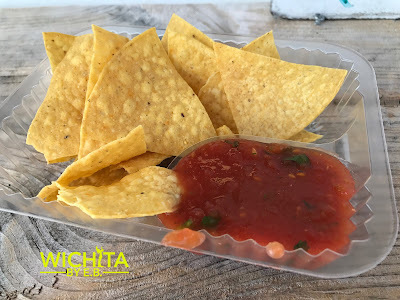 While the gentleman made our orders, he handed me a small container of chips and salsa for free. I really liked that price! The salsa unfortunately was pretty generic that tasted mostly like tomatoes with no hint of additional spice or peppers. It was a very nice gesture but not something I could recommend. Here’s to hoping the tacos were better. The tacos were the simple street tacos that you would find at any truck. The toppings were minimal with all the focus on the meat. The single corn tortilla had no problems keeping everything in tact; no problems with the taco falling apart. Of the meat options, the Carne Asada was the best of the three we ordered and that may have been by default. 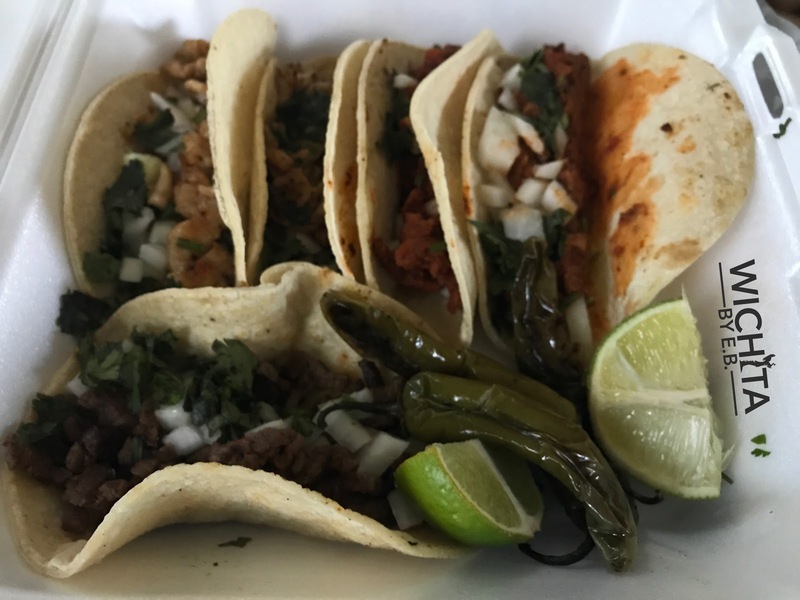 While none of the tacos were bad at all, we found the Al Pastor to not meet the expectations of othe nearby truck competitors or some of the best restaurants in town. The chicken was fairly basic in taste and needed some hot salsa to give it some additional flavor. 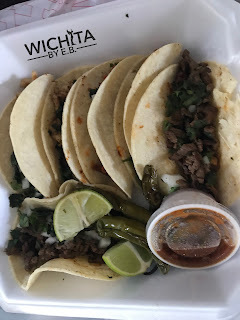 Overall, my brother, sister-in-law and I weren’t wowed by the tacos. The biggest fan was likely my 11 month old nephew who ate small bits here and there. If we stopped feeding him, he started to get fussy…..just like his uncle. I offered up the Tostada De Ceviche to them and they passed so it was up to me to give it a try. The Tostada was much better than the tacos. The ceviche or additional toppings all blended well; nice spicy little kick to it all as well. The only problem was the entire meal ended up getting soggy and falling apart. It was a messy messy meal by the time I was done. 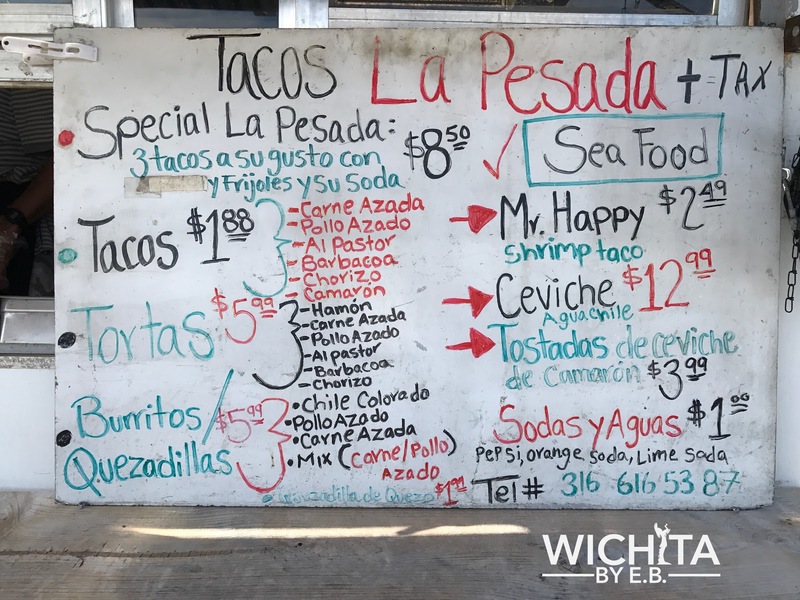 While not bad by any means, Tacos La Pesada missed the mark on being in the running for best taco in Wichita. The service was friendly; the food didn’t take long at all. But with so many competitors in the area, I’d be lying if I said it’d be a truck we’d visit again soon. You should have tried their barbacoa!! It’s the best. The chorizo is pretty good too. You won’t find no other taco truck with complimentary chips and salsa!